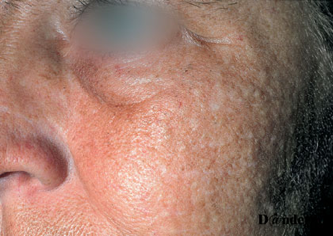 Acne vulgaris (or simply acne) is a chronic inflammatory skin disease of the sebaceous gland. Its clinical features include open and closed comedones (non-inflammatory lesions), papules, pustules (inflammatory lesions) and scarring. Acne is a common disease, affecting millions of people worldwide. The vast majority of teenagers suffer from mild acne. Although acne usually starts in the early puberty, it often persists into adulthood. Acne has a significant negative impact on quality of life and is associated with psychological distress and reduced self-esteem. Many different types of acne exists e.g. cystic acne, comedonal acne, acne neonatorum, steroid acne, acne fulminans, and cosmetic acne, and are can take mild, moderate and severe (inflammatory) forms. The yellow laser wavelengths specifically targets protoporphyrin IX. This is a chemical released by the bacteria that cause acne, and these bacteria are thus destroyed. In addition, this wavelength specifically reduces red skin color, and will make inflammatory lesions less obvious and less red. A variety of topical and systemic treatment options exists; however, they are associated with unwanted side effects. Laser/light therapy can potentially reduce the use of antibiotics and oral medications. Lasers with the wavelengths of 589nm and 1319nm have been shown to reduce the number of active lesions, limit oil production by the sebaceous glands and decrease redness in both active acne and acne scars. ADVATx has FDA and CE clearance for the treatment of Acne. Red or hypertrophic scars (e.g. related to acne or surgery) with vascular alternations and known to respond positively to treatment with light in the yellow spectrum. Hypertrophic scars tend to improve slowly over time; however, lasers in the 585-595 nm spectrums have historically been used to speed up the process. Most hypertrophic scars have an average of 50-80% improvement after two laser treatments, but results vary from patient to patient.